03-17-04 What's been happening so far this year? We took off the month of January, and started working on lots of little items in February. Probably the biggest change was reworking part of the rear axle. We changed how the rear sprocket mounted and that meant completely removing the axle. While we were at it, we also replace the rear bearings. If you're going to change the rear bearings, you ought to change the front ones too, so we also did that. The front bearings were changed to sealed ball bearings instead of grease packed roller bearings. During our annual cleanup, we had removed all the panels from the driver's compartment, so all of those got re-installed. The pedal assembly was removed and thoroughly washed. By March 6th, just about everything that could be done without installing a motor, had been. So we installed a motor. Or current motor is a loaner Hayabusa with NO2 injection. The installation went smooth enough, but while adding all the extra stuff, Mark found a large crack in the clutch cylinder bracket. This would be a big problem if left alone. The crack was ground out, welded up, a stiffener added to help prevent future cracks, and finally the bracket was cleaned up and installed. 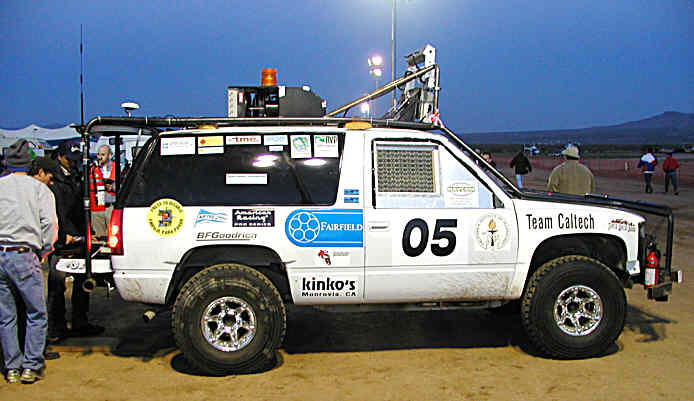 March 12th and 13th, Alan and I drove out to Barstow to watch and help with the DARPA Grand Challenge autonomous vehicle race. A friend of ours was a member of Team CalTech. We got out there at 10pm to find them working furiously on their car "Bob". It seamed that Bob had broken his steering by hitting a wall the day before. The steering pump was replaced, but they were still working on a better front bumper. I thought the SCTA started early, the military start even earlier. The first car started at 6:30 and Bob started third 10 minutes later. Unfortunately, Bob only made it about a mile and a half, before becoming tangled in a fence, and stopping. The farthest any car got was about seven miles, and most didn't even make it 200 yards, so Bob didn't do too bad. On Sunday, Alan and I went down to Mark's to try and start the motor we had installed the week before. Alan sorted out the wiring, while Mark did the water, fuel and oil. I added another button to the steering wheel to activate the nitrous. 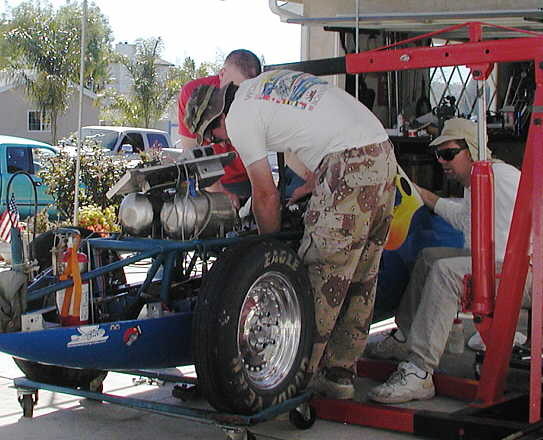 By about 4:00 we were ready to start the motor, but apparently it wasn't ready to start. We'd never had much trouble starting a Hayabusa, so we took it for granted that they'd start any time we wanted it to. Unfortunately that wasn't the case. After trying a variety of simple fixes, we gave up about 5:00 and got the car ready for this coming weekend, when it will be the guest of honor at the Gear Grinders Awards Banquet. Other non-car related news is that we now have our own Internet Domain at: www.ricevigeantracing.com . If you've been visiting our older page, switch your bookmarks to the new one.